Send a collection of premium artisan cheeses fresh from California wine country in this elegant willow basket to the cheese connoisseur in your life. They'll love the Fiscalini Cheddar, Bellwether Farms Carmody, Aged Vella Mezzo Secco Monterrey Jack, and Sierra Nevada Classic Aged Goat Cheddar cheeses. Enough to satisfy both a curious palate and a healthy appetite. 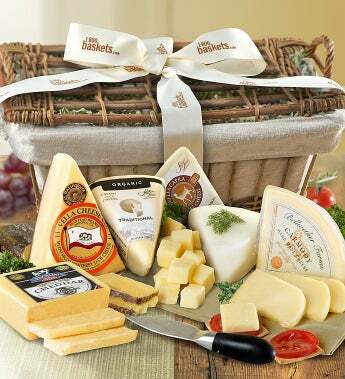 Send a collection of premium artisan cheeses fresh from California wine country in this elegant willow basket to the cheese connoisseur in your life.